Hamas operatives killed in Gaza: 341, official says. 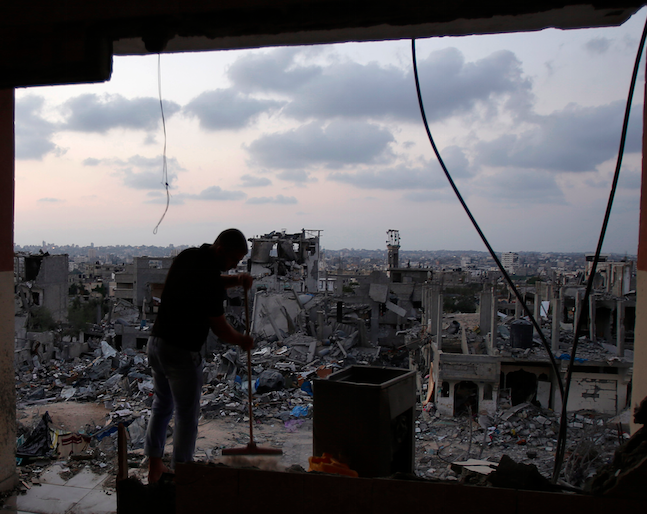 A Palestinian man cleans the remnants of his house in Gaza. An Israeli military intelligence offical says 341 of the individuals killed in Gaza during the Israel Defense Forces’ air and ground offensive have been identified as Hamas militants, the New York Times reports. The same official estimates that approximately 16,000 individuals in total fight for Hamas. On the contentious issue of Palestinian casualties, Israeli intelligence says it has confirmed the deaths of 341 Hamas operatives, 182 members of Islamic Jihad and 93 other militants who belonged to smaller groups or whose affiliation is not yet known. Another 706 of the 2,127 Palestinians killed have so far been identified by Israel as civilians, while 805 more casualties — 38 percent of the total — are listed as “unknown,” not yet categorized by Israel as either civilians or combatants. The United Nations and other monitoring groups say up to three-quarters of the Palestinians killed were civilians. Israel bombarded Gaza by air for 50 days, and a ground invasion lasted from July 17 to Aug. 5. IDF operations killed several top Hamas commanders and reportedly destroyed many of the tunnels used by militants to transport personnel and weapons.